Are you having difficulty getting pregnant? One way to track your ovulation cycle is to monitor your basal body temperature, and the best tool to use is a basal thermometer. What makes these thermometers different from regular ones? Well, they tend to measure your temperature to a more accurate degree, which will allow you to see any changes in your body temperature. This guide is designed to help you decide which features you need in a basal thermometer. We have also reviewed four different options that you may want to consider. Generation Guard is a family company that prioritizes the needs of your family. Our gold pick, which is the Generation Guard clinical basal thermometer, is a device that is loved by critics and consumers alike, just like many of our gold picks. The device is FDA approved and European CE approved to assure you that the thermometer is clinically accurate. 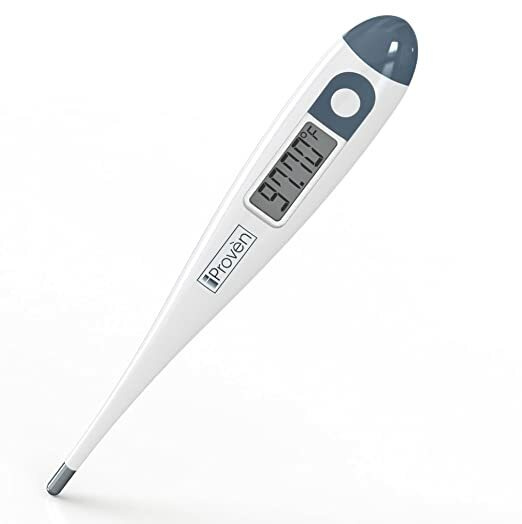 In fact, this thermometer is designed to track your body temperature to 1/100th of a degree in Fahrenheit, which is one of the most accurate readings you can get in a thermometer. The unit is designed with an incredible amount of sensitivity, so it can produce extremely accurate results. The process of taking your basal body temperature will take between 60 seconds and 120 seconds. When the device has an accurate reading, it will produce a soft beeping sound. This feature allows you to rest your eyes while the reading is in progress, which may be a welcomed few minutes since you are just waking up. This device features a LCD screen that is easy to read, and if you want to use a BBT (basal body temperature) tracking chart app, this thermometer is able to be paired with quite a few of them. Once you know what your basal body temperature is, you can easily clean the thermometer, since it is water proof, and then you can safely store it away in the clear case that is included with the product. When it comes to the reviews for the Generation Guard basal thermometer, there are quite a few to be found. On Amazon, 82 percent of the 182 reviews posted on the site have received positive four or five star reviews. The general consensus of this device is that it is incredible accurate and easy to read. The only thing that a few customers have mentioned wishing was included on the unit is a backlit LCD screen, which is a convenience of course, but not a required feature. Our silver pick is the Easy at Home basal thermometer, which is a digital device that takes your temperature orally. It is designed to be clinically accurate, which means that it records your temperature to the 1/100th of a degree. The device only takes about 120 seconds to acquire your temperature, but the actual amount of time will depend on the temperature of the room as well as your temperature. Once the reading is available for you to see, there will be a soft beep that can be heard three times to let you know that it is complete. If you hear that same beep ten times, that means that you have a fever that is over the normal range, which is above 99.50 Fahrenheit. The screen that you read the data on is a LCD screen that is backlit blue to make it easier to read, especially in low light areas like your bedroom in the early morning. The screen displays the date and the time that the reading was taken as well as your basal body temperature at that time. 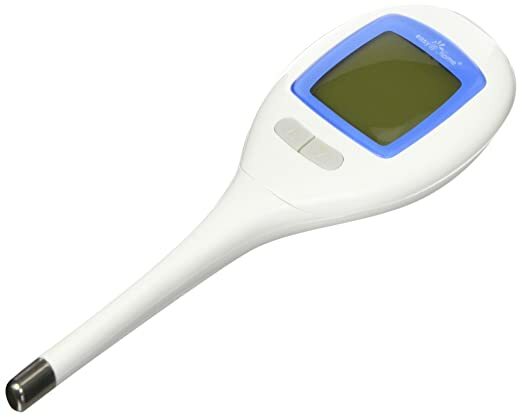 One feature that makes this thermometer stand out is the fact that it can recall up to 60 temperature recordings, so if you happen to forget to record a Monday’s data and you remember it on Wednesday, you will still be able to recall what your body temperature was on Monday. IProven is the mother’s first choice in care when it comes to their newborns, so it should also be where you turn to conceive. Their thermometer is a digital design that only takes seconds to measure and display your basal body temperature in the morning when you wake. Depending on the temperature of the room, it could take as little as 60 seconds to get a clinically accurate reading that is measured up to 1/100th of a degree. If you need a wakeup call to assure that you take your temperature at the same time every morning, then you are in luck. This model has a soft wake up beep that is designed to wake you up and only you, just like our silver pick. If you are too tired to record the data, then the device will store it for later. As an added bonus, this basal thermometer will turn off automatically after five minutes. When you are awake enough to record the data from the early morning reading, simply press and hold the button on the thermometer for about three seconds to bring the information back up on the LCD screen. 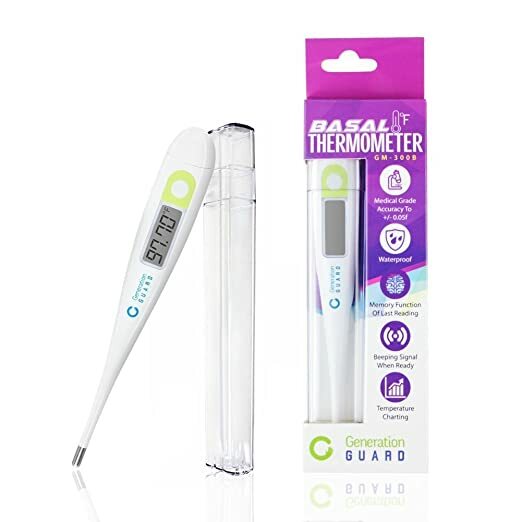 When you purchase this basal thermometer, the manufacturer provides you with a convenient case to carry the device in, a free basal body temperature chart that can be downloaded from their site, and a limited one year warranty to stand behind their product. Insofar as reviews, 80 percent of the almost 300 reviews that have been posted on Amazon have received a positive rating. Many of the customers who have used this device have stated that it is extremely accurate, which is the main functionality that you should be looking for when you are trying to conceive. Our ballin’ on a budget pick is the Mabis basal thermometer. It is a digital device that is FDA approved to be clinically accurate to 1/100th of a degree, which is a great standard to expect when you are trying to conceive. The exterior of the unit is soft pink and white, which gets you in the baby mindset. It only takes about 60 seconds to get an accurate reading, but the time can fluctuate slightly if the temperature in the room is a little cool. Even 90 seconds is not a lot of time to get an extremely accurate reading that will help you and your loved one have a baby together. When your body temperature has registered, you will hear a gentle beep that is designed to let you know that the data is ready for you to record. The unit features a LCD screen that can save the last temperature that was recorded, which is a great feature to have in the event that you fall asleep. Once you are ready to record the information, simply press the button on the device to bring the information back on the LCD screen. There is also a 12 month ovulation calendar included with the packaging to help you record your body temperature every day. A storage case is also included to give you a place that is dust free to store the thermometer. There are two types of basal thermometers that you can purchase, which are the digital type or the glass type. Glass thermometers tend to take a bit longer to get an accurate reading, but they are oftentimes more accurate than the digital options. The other issue is that glass thermometers can easily break if they are dropped, but on the other hand, a digital one can have an electronic failure or run out of battery juice. Decide whether speed or accuracy are more important to you, and then choose which type of basal thermometer fits your needs. When you are trying to get pregnant, you may be anxious, especially in the morning when you are trying to find out your body temperature. You want a thermometer that is fast and accurate, but taking your temperature for too little of a time can make the reading inaccurate. The device needs to be reading your body temperature for at least 30 seconds, but to assure the results are accurate you want a thermometer that will have your results in about a minute. The reason that a basal thermometer is better for determining your ovulation cycle is that it actually will determine what your body temperature is down to 1/100th of a degree, which is the extreme level of accuracy that is required. This is because when you ovulate, in most situations your temperature only rises by half of a degree to one degree, which may be too small of a difference to notice on a regular thermometer. Since your basal body temperature is taken right when you wake up in the morning, you may be groggy while taking it. This issue is solved by the sound functionality that is included in some basal thermometers. It will make a beeping sound when the results are in to let you know, just in case you start to nod off again. Some devices vibrate instead of beep, which is actually preferred by some individuals, so decide which method, if any you prefer. Also, when you wake up, it may be dark in your bedroom, which makes it hard to see the display on the thermometer to see if today is the day. Some thermometers have a backlit display that will make it easy to read in low light situations. Since you are going to be just waking up when you take your basal body temperature, it is likely that you will not be able to record the information immediately. To help keep you from forgetting the data, some thermometers record the last temperature that was recorded. There are a few on the market that record a few more than the last temperature, so if you think you will need that reminder of what the reading was, then look for a device that can record it for you. Taking you temperature can be fast and convenient with many of the basal thermometer available, but you still have to record the results in most situations. Since your basal body temperature is taken first thing in the morning, you may not want to rush out of bed to record the results. Some devices do record the last result, but what happens when you wait until later and then completely forget to record the data? Having a basal thermometer that can link up to an application on your cell phone or tablet and simply upload the information takes the step of recording the information out of your hands. If this is a feature that you think calls to you, then see if it is available on the basal thermometer that you are considering purchasing. Trying to have a baby can be a stressful time, so instead of worrying about when your ovulation is going to happen, you can take the initiative and track your basal body temperature to see when if fluctuates. Hopefully this guide has helped you decide which basal thermometer to purchase, but if not, then take another glace at our pre-purchase considerations to help you find a device to help you track your ovulation. With the help of a basal thermometer, you will be waiting for the arrival of your new born baby in no time.